This week, Script Intelligence awarded our partners at PPD with another accolade for their use of ProtoSphere. This is the second year in a row PPD has been recognized like this and we couldn't be more proud and honored. WILMINGTON, N.C., (November 29, 2012) - Pharmaceutical Product Development, LLC (PPD) today announced it has been recognized by Scrip Intelligence with its 2012 award for Best Technological Development in Clinical Trials for deploying cutting-edge solutions advancing clinical research. PPD received the honor at the annual Scrip Awards ceremony Nov. 28 in London, marking the second consecutive year PPD won for best technology after receiving the 2011 Scrip Award for Best Contract Research Organization (CRO). "Winning this award for the second consecutive year is a testament to the people of PPD," said David Simmons, chairman and CEO of PPD. "In today's evolving health care model, CROs must be able to adapt to clients' changing needs and proactively meet their challenges. PPD connects talented people and innovative solutions to exceed the needs of our biopharmaceutical industry clients, who are constantly seeking ways to increase productivity and efficiency." 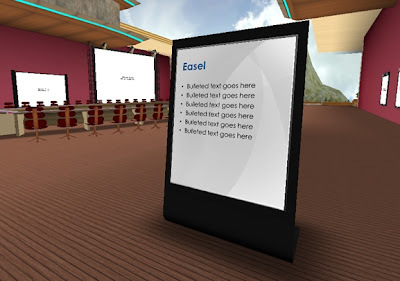 The Scrip Award for best technology recognized PPD® 3D, a virtual learning environment PPD created with ProtonMedia to provide a scalable and sustainable global training model. PPD 3D improves how PPD trains clinical research associates to monitor clinical trials, which is vital for enhancing the quality of site management and clinical monitoring for clients' research programs, and can contribute to faster project startup. "PPD were worthy winners of this award," said Mike Ward, chief content officer for Datamonitor Healthcare and Scrip Intelligence. "Their PPD 3D technology has improved the cost-effectiveness, speed and quality of clinical trial training for the life sciences, and our judges were impressed by the novel use of this type of technology in clinical research, saying it has huge potential." The Scrip Awards acknowledge achievements across a broad range of areas in the biopharmaceutical industry. Attracting hundreds of industry professionals from the world's leading pharmaceutical and biotechnology companies, the awards have become a distinct mark of superior achievement. Pharmaceutical, biotech and contract research organizations compete for awards in 15 categories, which are decided by an expert panel of judges. I recently gave David Maldow, of Telepresence Options, a tour of our ProtoSphere environment. He published an article today on his site about the experience. Thanks for the write-up David! It's been an exciting day for our partners at Polycom. Today they made a number of announcements around new user experiences on their video endpoints and new enhancements to the RealPresence Platform that are more universally accessible by ensuring multi-vendor interoperability, eliminating barriers to access, and bringing down the cost for enterprises to video-enable their organizations. I especially liked Andy Miller's presentation this morning that was broadcast live from the NASDAQ in NYC. If you missed the live stream, you can check out the replay available on their website. Our CEO, Ron Burns, recently had a chance to speak with Jerry Roche, the Editorial director at Elearning! Magazine, for an article he wrote in this month's issue about driving learner engagement through the use of virtual environments, like ProtoSphere. You can read the article on their website. Folks at this week's Enterprise Learning Conference are getting a free copy of the magazine and can read more about some of the things we're seeing in this space. Stop by our booth, #305, and ask us to show you what we're doing with ProtoSphere to help deliver more engaging training. Our flights are booked and our hotel reservations are made... we're headed to Irvine, CA next week to attend this year's Enterprise Learning! Conference & Expo. We'll be exhibiting in booth #305 and showing off the latest version of ProtoSphere 2.1, specifically its set of features designed for training and learning engagements. This year's show promises to be a good one. 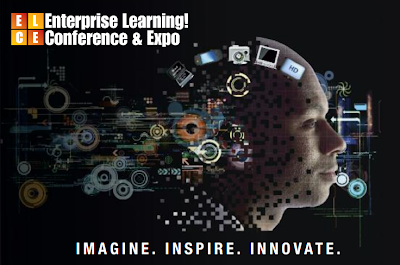 The conference schedule is packed with elearning industry thought leaders planning to talk about the latest technologies and best practices being used to improve learning within the enterprise. Stop by and say hello if you're out there, and see how ProtoSphere can help you "Imagine, Inspire, & Innovate". I'm very pleased to announce today that ProtonMedia and Microsoft have become members of the Asia Training Consortium, a part of the Pan-Asian Clinical Research Association (PACRA). In partnership with Merck and Microsoft, we will be providing our ProtoSphere virtual immersive environment as a means to allow all ATC member organizations a centralized location for the collaboration and delivery of various global training initiatives. We issued a press release on the news today so I'll turn your attention to that for more information. The Asia Training Consortium (ATC), a Merck-sponsored group of pharmaceutical companies and clinical research organizations that was formed in Shanghai in 2011, has added ProtonMedia and Microsoft Corporation to ATC to offer best-in-class collaborative cloud solutions to the group, as it seeks to pool resources to train clinical research professionals in the Asia Pac region. Member companies currently include Merck & Co. (MSD), Orchestrall Inc., RPS, PACRA, Covance, Bayer Healthcare, Pfizer, ClinTec International, Edinburgh Napier University, Novartis China, and UL Eduneering. ProtonMedia and Microsoft have now joined as member companies. “Merck believes the entire life sciences industry will need to move towards these kinds of collaborative hubs to reduce the cost of drug development and speed the time to market for new medicines,” says John Constantine, Executive Director & Dean, of the Merck Polytechnic Institute. Merck & Co. is a founding member of ATC and has been a leader in the training area. ProtonMedia will provide ProtoSphere®, its innovative training and collaboration solution to ATC members. Operating on Microsoft’s secure cloud, ProtoSphere® will allow ATC companies to connect and collaborate on a variety of global training initiatives. This advanced 3D immersive environment will be the first of its kind deployed cooperatively for the Life Sciences industry. “We are honored to be participating in this very forward looking program and believe collaborative cloud based hubs will be instrumental in transforming the entire life sciences industry in the years ahead” says Ron Burns, CEO of ProtonMedia. ATC was initiated in October 2011 in Shanghai when multiple pharmaceutical companies and CROs convened to address the common issues of training in the Asia Pacific region. Zoom in on the Media Board you wish to turn into a whiteboard. In the Action Bar at the bottom, click on Add Text. 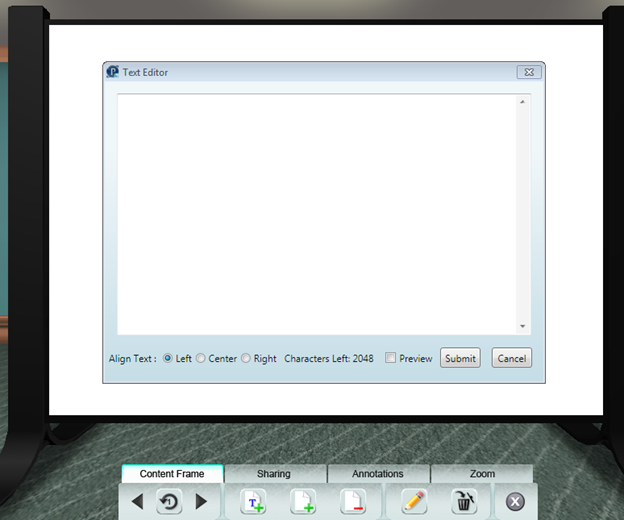 Within the Text Editor window, hit your spacebar to enter a single space character. Then click Submit. 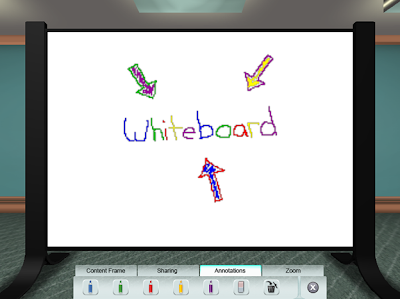 You’ll now have a clean surface to use as your whiteboard. Click the Annotations tab and have at it. I walked into the office this morning to learn of some really exciting news… our friends at PPD have been named to the 2012 InformationWeek 500 for their use of ProtoSphere! We’ve mentioned PPD a number of times in the past, and in fact, this isn’t the first time they’ve been recognized for their innovation. They were named Best Contract Research Organization and honored for Best Technological Development in Clinical Trials by Scrip Intelligence and won Microsoft’s 2011 Life Sciences Innovation Award. We continue to be very honored that ProtoSphere and our partners are being recognized in this manner. Great job all around! WILMINGTON, N.C. (September 12, 2012) - Pharmaceutical Product Development, LLC (PPD) today announced it has been named to the 2012 InformationWeek 500, an annual recognition of the most innovative users of business technology in the United States. 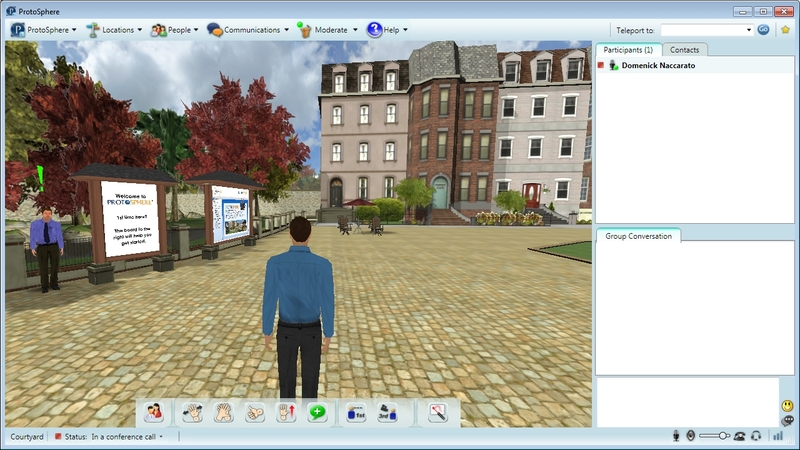 PPD was selected for its commitment to industry-leading technology solutions, including PPD® 3D, a unique avatar-based virtual learning environment created to train employees on a global scale. 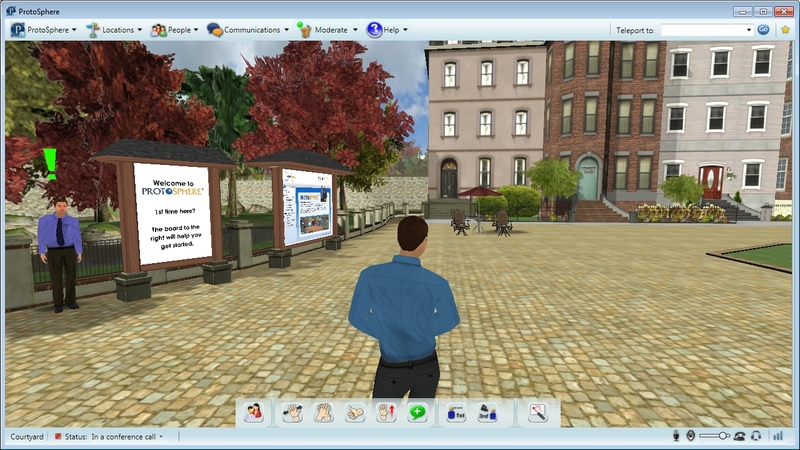 PPD collaborated with ProtonMedia on its ProtoSphere platform to adapt PPD's classroom training programs for the virtual-world environment. The company deployed PPD 3D across global operations to improve the speed, quality and cost-effectiveness of preparing researchers who oversee clinical trials of new medical treatments. "Our traditional classroom training program was highly acclaimed and effective for on-boarding and preparing clinical research associates," said Mike Wilkinson, PPD's chief information officer and executive vice president. "Yet our traditional model was not sustainable for a globally deployed staff. 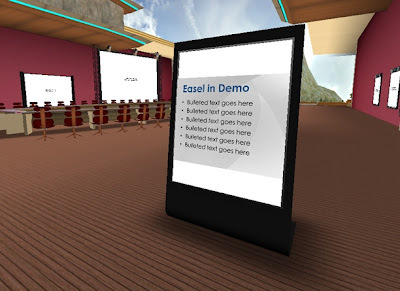 Our learning and technology team evolved our training program to create a highly engaging, interactive and always-available virtual learning environment. The results have been impressive, and we plan to expand the use of PPD 3D to help our clients develop the critical therapies needed in today's fast-changing health care environment." 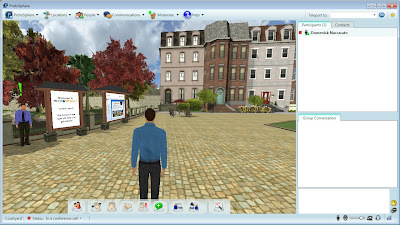 Using personalized, culturally appropriate avatars in PPD 3D, clinical research team members and clients interact in highly social, collaborative and visually appealing three-dimensional virtual spaces. PPD 3D provides mobile learning, communities, blogs, wikis, forums, expert directories and social networking capabilities, while bringing two-way engagement to online learning. Users talk, send instant messages, view and interact with presentation and media content, record notes and access the Web - all at the same time, from anywhere. "The InformationWeek 500 has recognized the most innovative users of business technology for 24 years, and this year's innovations were particularly impressive," said InformationWeek Editor In Chief Rob Preston. "What the editors looked for are unconventional approaches - new technologies, new models, new ways of grabbing business opportunities and solving complex business problems with IT." In its third consecutive year being named to the InformationWeek 500, PPD ranked in the top 125 of U.S. business technology leaders. InformationWeek 500 rankings spotlight the power of innovation in information technology, rather than simply identifying the biggest IT spenders. The award was presented at a ceremony in Dana Point, Calif., on Sept. 11. For more information, visit www.informationweek.com/iw500. PPD is a leading global contract research organization providing drug discovery, development and lifecycle management services. Our clients and partners include pharmaceutical, biotechnology, medical device, academic and government organizations. With offices in 46 countries and more than 12,000 professionals worldwide, PPD applies innovative technologies, therapeutic expertise and a commitment to quality to help clients and partners accelerate the delivery of safe and effective therapeutics and maximize the returns on their R&D investments. For more information, visit www.ppdi.com. Except for historical information, all of the statements, expectations and assumptions, including statements, expectations and assumptions about PPD being named to the InformationWeek 500 list, contained in this news release are forward-looking statements that involve a number of risks and uncertainties. Although PPD attempts to be accurate in making these forward-looking statements, it is possible that future circumstances might differ from the assumptions on which such statements are based and could cause actual results to differ materially from the forward-looking statements. Other important factors that could cause future results to differ materially include the following: rapid technological advances that make our services less competitive; competition in the outsourcing industry; the ability to control SG&A spending; risks associated with acquisitions and investments; the ability to attract, integrate and retain key personnel, including our chairman and CEO; overall global economic conditions; economic conditions, research and development spending, and outsourcing trends in the pharmaceutical, biotechnology and government-sponsored research sectors; consolidation in the pharmaceutical and biotechnology industries; PPD's ability to win new business; loss, delay or modification of large contracts; higher-than-expected cancellation rates; the rate of conversion of backlog into revenue; actual operating performance; compliance with drug development regulations; and changes in the regulation of the drug development process. PPD assumes no obligation and expressly disclaims any duty to update these forward-looking statements in the future, except as required by applicable law. These forward-looking statements should not be relied upon as representing PPD's estimates or views as of any date subsequent to the date hereof. The ability to control your view of the 3D environment in ProtoSphere is important, however we’ve designed it so that you don’t have to be a rocket scientist to figure it out. We’ve employed simple interactions, such as hitting the V key on your keyboard to toggle back and forth between 1st and 3rd person views, enabling the scroll wheel on your mouse to do the same, or allowing you to right-click and drag your mouse in order to look around the space. But did you know there’s another view in ProtoSphere that gives you a lot more flexibility in where you position your camera, called the “Free Camera View”? While in this mode, you’re moving your camera around, not your avatar. 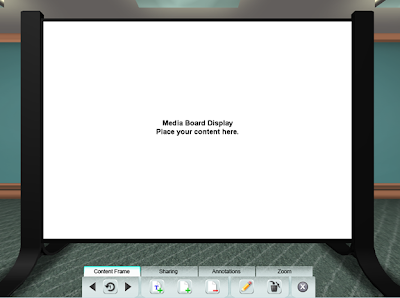 But you can still interact with objects, such as clicking on a chair, or zooming into a Media Board. To return your view back to what it was prior to entering this Free Camera View, simply hit CTRL + SHIFT + C again on your keyboard. In this week's tip, I want to show you a quick and easy way to maximize your view of the 3D window. I've had trainers tell me they use this technique to get a better view of their class and I personally use it if I'm in a meeting where the conversation is mostly taking place over audio. Note that maximizing your view of the 3D window will temporarily hide both the People lists and Conversation area that are on the right side of the screen. To maximize your view of the 3D window, simply double-click anywhere on the border that separates the two areas of the screen (see where the arrows are pointing below). ProtoSphere with the People lists and Conversation area visible. ProtoSphere with its 3D window maximized. To restore the 3D window, the People lists and Conversation area to their previous configuration, double-click again on the vertical border that is now located on right edge of the screen. I hope you enjoyed this Tip of the Week. If there's another feature that you'd like covered, please let us know. We're starting a new series of blog posts where we'll share various tips & tricks, techniques and overall best practices to help you get the most out of using ProtoSphere. Although much of this information is documented in the User Guides that are distributed with the product, we thought it might be helpful to remind users about how to use specific features and do other things that may have been overlooked, but can help tremendously, when planning for and conducting training sessions, events or meetings. In this example, the easel's surface is vertically oriented to display in a portrait layout. The slide being shown is typical of those created using a slightly modified default PowerPoint template (we only added a background graphic). As you can see, the slide does not fill the available space leaving both the top and bottom of the display unused. 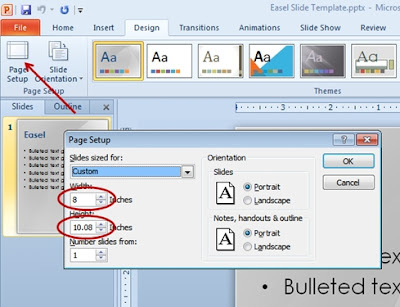 To make full use of the space available on this particular Media Board, you will need to change PowerPoint's Page Setup Properties for the presentation so that it is vertically oriented. 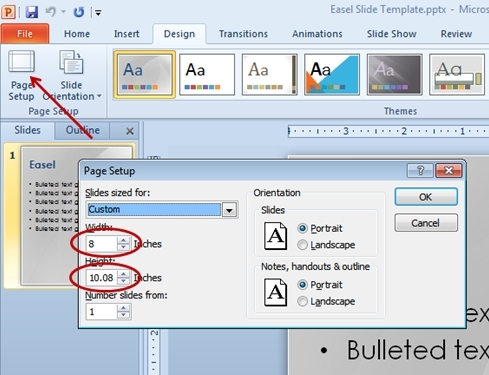 To do that (in PowerPoint 2010), select the "Design" Tab, then click on "Page Setup". As shown in the above picture, when the Page Setup window displays, you can change the "Width" and "Height" in the "Slides sized for" section to match the size of the Media Board. In this example, those values are 8” wide x 10.08” high. Finally, click "OK" and you're ready to upload your presentation. 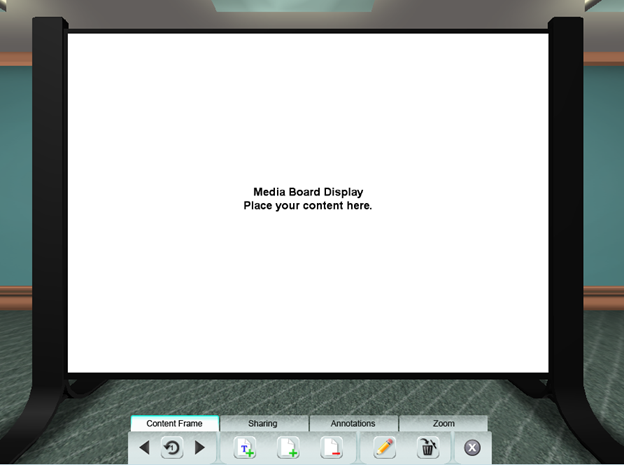 To make things a bit easier for you, you can download some PPT templates that are specifically sized to work on the various Media Board surfaces within ProtoSphere (the link will download a .zip file). We hope you enjoyed this Tip of the Week. If you would like to learn how to do something specific, please don't hesitate to contact us. The other day, Jeff Owen over at Telecom Reseller, conducted a short podcast interview with our CEO, Ron Burns. During the interview, they discussed a variety of topics including our new version of ProtoSphere, 2.1, how it stands out against the competition and our integration with both Microsoft Lync and Polycom. The whole podcast is only about 13 minutes long, so jump over to their site and give it a listen. If you have any questions, please don't hesitate to ask. 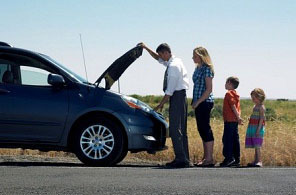 You can leave them in the comments or give us a call at (215) 631-1401. Thanks to Jeff Owen and the crew at Telecom Reseller. We are proud to announce that ProtoSphere®2.1, which we unveiled at Microsoft’s 2012Worldwide Partner Conference in Toronto, is now available for download. Version 2.1 is more than just a step up from Version 2.0 which was released back in January; it’s a significant upgrade featuring even more support for Microsoft’s Office suite (among other enhancements). “While the version number might suggest merely an incremental change, this new version includes a lot of new features that our enterprise customers have been asking for,” said Ron Burns, our CEO. · Ability to book virtual rooms for meetings and events directly from a user’s Outlook calendar. · Updated SharePoint integration to support site-federated authentication. · Office 365 authentication and interoperation. · Scripting capabilities for developers to create custom interactions (such as adding URLs to objects). · Enhanced security for Moderator controls. · Backwards compatibility with the previous versions. Needless to say, we’re very excited about Version 2.1. The enhancements and system improvements are going to go a long way to helping users to get even more out of ProtoSphere®. It’s also going to be a big step towards even deeper penetration into the enterprise. Now that we’ve released ProtoSphere® 2.1, I’m sure you’d like to know exactly what’s new under the hood. Short answer; a LOT! Long answer; keep on reading. Our new Outlook add-in allows users to book a room in ProtoSphere® 2.1 directly from Outlook. Supports Outlook 2010 and 2007, connected to Microsoft Exchange (Outlook 2003 not supported). User can book a location directly from their calendar. Built-in scheduling tool shows availability of locations. Secured Rooms (Only invited users are allowed access to the room during a meeting). Meeting organizers automatically granted moderator rights. Adding custom scripts to objects. SharePoint: Support site-federated authentication and Office 365 authentication and interoperation. Moderators: Access controls are now defined by a custom claim in AD. Laser Pointers: Can now be controlled by Moderators. Notifications: Audible notifications heard when sending/receiving IMs are now entirely dictated by the Lync client. Excel Exports: Export usage report to Excel. 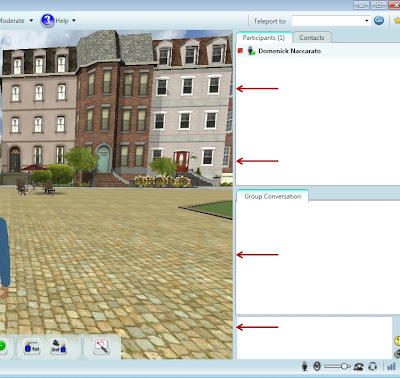 Performance Improvements: Platform enhancements including streamlined 3D Avatar rendering and increased frame rates. Browser Location Refresh: A ‘Refresh’ button has been added to update the user count in the locations listing. Zone ID: Added to the Tooltip visible on mouse over of the location’s name. User Counts: Total number of users now listed on the Participants and Contacts tabs. Keyboard Controls: For moving Media Board slides forwards and backwards. Port Forwarder: Allows more broad proxy support. YouTube Support: Updated method for showing YouTube videos added to documentation. Password Reset: Option added to user login screen. Backwards Compatibility: ProtoSphere® 2.0 users will be allowed to connect to ProtoSphere® 2.1. Are you an Inside Sales Rep? We're Hiring! We're seeking an energetic, aggressive Inside Sales Representative to sell ProtonMedia’s award winning Learning and Collaboration solution, ProtoSphere as a member of the Inside Sales team in Lansdale, PA (Philadelphia suburbs). This is a fantastic opportunity to be in spirited, start-up atmosphere selling exciting, next-generation technology products to Fortune 500 accounts. The Inside Sales representative will team with an experienced outside sales representative to grow & expand relationships with existing accounts and identify, initiate and develop relationships with new accounts. Inside Sales representatives will be responsible for targeted email & phone campaigns, messaging, appointment setting, high-level demonstration participation and proposal generation. Each inside & outside sales team will be expected to meet sales targets and monthly activity metrics. ProtonMedia will provide on-going technical and sales training. There is a clear career path for growth and un-capped earnings potential. This job is base + commission with comprehensive benefits starting the first day. Generate prospective customers through cold calling (50+ meaningful calls/day). Sell to new accounts, accurately quote product prices and prepare sales bids. Evaluate customer needs, and identify the proper resources to accomplish the goal. Establish and maintain positive relationships with customers. Learn and maintain knowledge of ProtonMedia products, business and value-add. Make value-added sales proposals to existing and potential customers. Experience in high-activity positions, at college or in workplace. High energy, assertive approach to the work day. Excellent verbal communication and negotiation skills. Track record of success, academically and/or professionally. Bachelors or Associates degree, or training, or equivalent combination of education and experience. Ideally,1-4 years of experience in a technical sales environment selling directly to business customers. Dynamic, confident individual with a sense of humor. A quick learner, technologically savvy with high energy/drive level, excellent written and verbal communication skills, excels in a team environment! If you think that you have the ingenuity and skills to help take ProtoSphere and ProtonMedia to the next level, please reply via Linkedin or email us a cover letter telling us how you would help along with your resume. There’s an old saying in marketing and publicity circles that “any press is good press,” which is why so many rock stars destroy hotel rooms; it gets them attention. At ProtonMedia, we’ve never destroyed any hotel rooms (well, not yet), but we are getting a LOT of attention. The list below links to stories posted about us or where we’ve been prominently mentioned over the past two weeks. It’s a great list and we’re very thankful to all the websites who mentioned us. Of course, when someone posts a story with a headline that essentially says that ProtoSphere “destroys” the competition like the Lazy Tech Guys did, that’s just awesome. Actually, the Lazy Tech Guys featured us in two posts last week. The first was on July 16 in Polycom Opens Its Video Collaboration Platform To All, Releases APIs. The second (mentioned above) was two days later, on July 18, and the Lazy Tech Guys got right to the point titling their post, ProtonMedia CEO Shows Us Why ProtoSphere Destroys Second Life and PS Home. 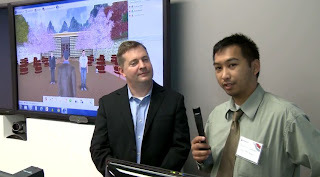 The Lazy Tech Guys interview with Ron took place on July 12 at Polycom’s Headquarters in San Jose, California. Ron flew there directly from the Microsoft Worldwide Partner Conference in Toronto (where we were exhibiting and where Ron also presented) to attend a major Polycom Press Conference where Polycom announced their new Suite of Open APIs, Enhanced Scalability, Manageability and Security for RealPresence® Platform. Polycom also prominently featured us in their Press Release following the event (click on the link above and look closely at Bullet #3 about halfway down the page. That’s us!). This coverage was fantastic and we’re very excited to have received it. Thanks to the Lazy Tech Guys, IDG’s family of websites and all the other websites who covered the story. And of course, thanks to Polycom. Yesterday, Polycom announced a major new initiative to “Drive UC and Video Adoption Across Industries.” In their press release, they mentioned ProtonMedia and quoted our CEO Ron Burns. This week, we are announcing ProtoSphere®2.1 at Microsoft’s 2012Worldwide Partner Conference in Toronto. Featuring a wide range of new tools and capabilities designed specifically for the enterprise, ProtoSphere® 2.1 is a dramatically enhanced version of our leading collaboration platform, ProtoSphere. “While the version number might suggest merely an incremental change, this new version includes a lot of new features that our enterprise customers have been asking for,” said CEO Ron Burns. While ProtoSphere® is the first and only immersive, 3D social collaboration environment that directly integrates with both Microsoft’s Office and Lync products, Version 2.1 adds even tighter integration with Outlook. Now, users can book virtual rooms for meetings and events directly from their Outlook calendars. Updated SharePoint integration to support site-federated authentication, Office 365 authentication and interoperation. Ron will be presenting ProtoSphere® 2.1 to a large audience of Microsoft employees and Partners during Microsoft’s 2012Worldwide Partner Conference in Toronto. That presentation will be at the Microsoft Office Division’s “Future of Productivity” Theater on Wednesday, July 11 at 3:00PM EDT. 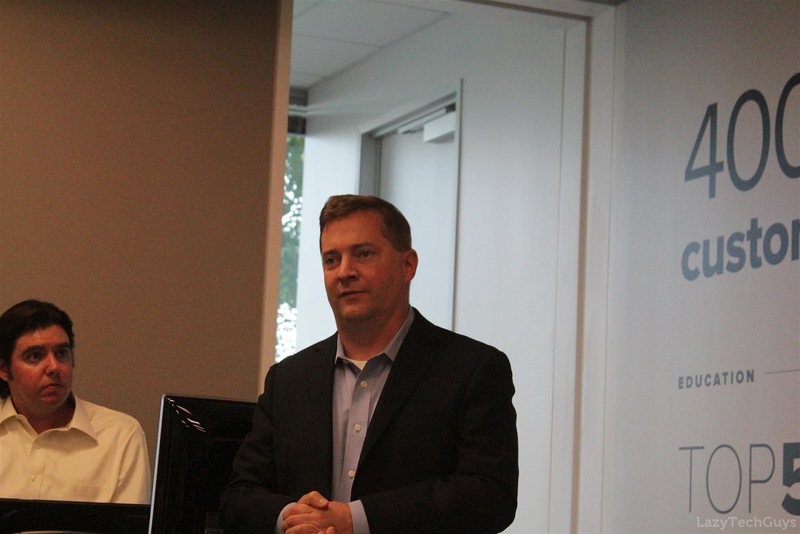 Ron was also invited by Lync Enterprise Voice CTO Aamer Kaleem, to host a "Lunch 'n Learn" session with fifty of Microsoft's leading global business development managers who focus on the Lync Enterprise voice technology. Neal Wiser is Vice President, Strategic Marketing at ProtonMedia. If you have any questions about our appearance and scheduled presentation at the WPC, don't hesitate to contact me at neal.wiser@protonmedia.com. Hey folks, The ProtonMedia team has arrived in Toronto to participate in this year’s Microsoft World Wide Partners Conference (also see the show's website). We'll have some exciting announcements coming later in the week, so stay tuned. If you happen to be at the WPC this year, stop by our booth #230. Ron Burns, our CEO, will also be speaking at the Microsoft Office Division’s “Future of Productivity” Theater Wednesday, July 11 at 3:00 PM (EDT). Catch our session if you're free! 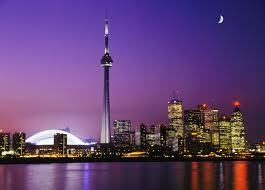 To all our friends in the Microsoft eco system, safe travels to Toronto. I’m extremely excited to announce that I’ll be one of the featured guests on this month’s Information Week - Valley View live online TV show. InformationWeek Editorial Director Fritz Nelson and UBM TechWeb Chief Content Officer David Berlind have created a live-streaming video show to get inside companies, demonstrate the newest technologies, and rip apart the most compelling topics in the valley. ProtonMedia was asked to join the April show (scheduled for April 24th) and it really is a great opportunity for us. You can see past sessions at the Valley View site (I’ve watched a number of them and Fritz & David do a fantastic job). Joining me on the show is a powerhouse line-up including: SAP's SuccessFactors – CMO, Kara Wilson, ARM - Lead Mobile Strategist, James Bruce, DataSift – CEO, Rob Bailey, and Zynga - CTO of Infrastructure Engineering, Allan Leinwand. I’ll be doing a live demo of ProtoSphere and you can register here to see the event (it’s completely free!). Hope you can join us! And remember, we will be live…so anything can happen. The past 2 weeks have sure been busy for everyone here at ProtonMedia. We’ve been to 2 events over the past 10 days both in Orlando Fl. We were at both Enterprise Connect and Team Polycom. Each time through the Orlando airport, I tried to avoid being held up by a large mouse, who tends to be quite skilled at taking money from the innocent ; ) I am happy to report, we survived the ordeal! Both events were really great! Enterprise Connect is an event dedicated to discussing communications that transform business and we were able to demo ProtoSphere to a huge number of prospects. We also presented at the Microsoft booth, which was a great experience and drove a lot of traffic through each of our locations. Our second event was Team Polycom. We were invited to exhibit by Polycom and got a chance to work with one of the most important Lync partners (Thanks Polycom!). Thanks again to both Enterprise Connect and Team Polycom…both of you really know how to put on a great event. ProtonMedia is up for an Award! We are honored to announce that ProtonMedia has been selected as a finalist for the PACT Enterprise Awards. ProtonMedia is nominated for 'Technology Startup Company' for 2012. The awards ceremony is on May 3rd, so keep your fingers crossed that we will be adding another trophy to the shelf! Thanks to PACT for selecting ProtonMedia as a finalist. I recently spoke with MedCity News and we had a great conversation. The title of the article is, "Welcome to the Matrix: Using Virtual Reality to Develop Global Clinical Trials"
Even though we can't quite dodge bullets in ProtoSphere (yet! ), there are a number of really cool applications for 3D Immersive Technologies including global clinical trials. Hey now, we are headed to Orlando for the Enterprise Connect 2012 conference! If you are not familiar with this show, it is the hot Unified Communications gathering of the year, and many of the top technology vendors will be showing off their new stuff..
We will be showing our new stuff, ProtoSphere 2.0, at our booth (#310). We are also very excited that Microsoft has asked us to showcase ProtoSphere at its booth, #816. We’ll be posting news from the show floor here, next week. CEO IntroNet has posted two different conversations that Patti and I had. The first is a short overview of ProtonMedia and touches on our success with PPD and the published case study that Mircosoft did on us. The second is an industry roundtable with Tom Connolly the President of BizTech regarding our differing opinions on the value of technology and strategic partners. It was a great afternoon and I really want to thank Patti for her time. Give it a read and let me know your thoughts. I spent some time last week at ITExpo East. It was a great event and I left with some wonderful new bits of knowledge. I also had the opportunity to present at the event with a great panel of individuals. Our topic was: “Beyond travel avoidance – the real value of HD videoconferencing and collaboration” and it was an awsome experience. One of the true highlights of ITExpo East was a wonderful interview with Susan Campbell, TMCnet Contributing Editor, regarding "Leveraging the Power of Social Collaboration". It was a great conversation and I want to thank Susan for her time and article!